Our hoop sizes are all measured by inner diameter (ID) - from inside edge to inside edge. For a 3/4" hoop: subtract 1.5" to convert from outer diameter (OD). For example, a 35" OD hoop is 33.5" ID. For a 5/8" hoop: subtract 1.25" to convert from outer diameter (OD). For example, a 35" OD hoop is 33.75" ID. We only offer sizing in half-inch increments, so you will need to round to either 33.5" ID or 34" ID for ordering. Please note that SpinFX Phoenix hoops were measured by OD! If you're ordering a Hyperion Phoenix hoop to match an existing SpinFX Phoenix, make sure you subtract 1.5" from the size. The original 3/4" Hyperion includes one free downsizing. The Hyperion Phoenix and Hyperion Lite hoops do not. Resizing prices are slightly different for the two models because of the greater wiring complexity of the Phoenix. Buying a hoop as a gift and not sure what size to order? If the recipient is an experienced hooper, we recommend measuring their favorite hoop. Be sure to measure by inner diameter, and make at least two measurements since hoops are often not quite round. Beginning hoopers just getting started will tend to drop hoop sizes very quickly. This makes the original Hyperion, with its free downsize, a great option for those worried they might need a smaller size in the near future. 22" - 25" Minis. Often used in pairs and mostly for off-body work except for very advanced hoopers. 26" - 29" Small and fast, favored by advanced hoopers. 30" - 33" Our most popular range for intermediate to advanced hoopers. 34" - 36" Beginner to intermediate, also popular with circus performers. 60" Giant, good for tandem hooping. We have two. You can't have them. HDPE (high-density polyethylene) tubing is milky white and diffused, moderately stiff, and durable. It's the type of plastic milk jugs are made from. Small scratches can be sanded and buffed out. HDPE softens when hot but handles cold better than polypro. It can be kinked but is very resistant to cracking and shattering. 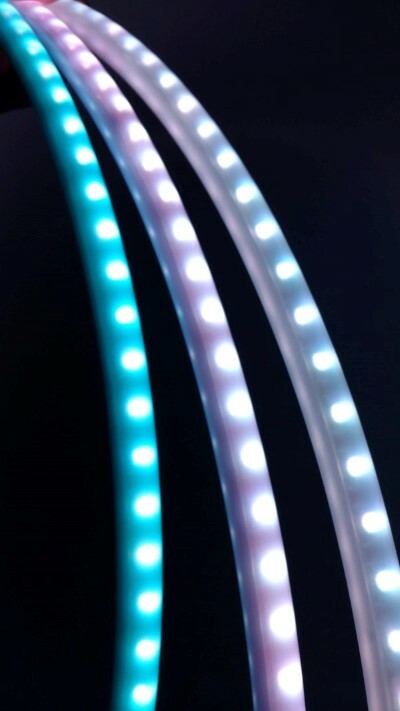 LEDs shine through HDPE with a slightly diffuse glow, and the internal parts of the hoop are mostly concealed. Note that HDPE is not available for 5/8" hoops. 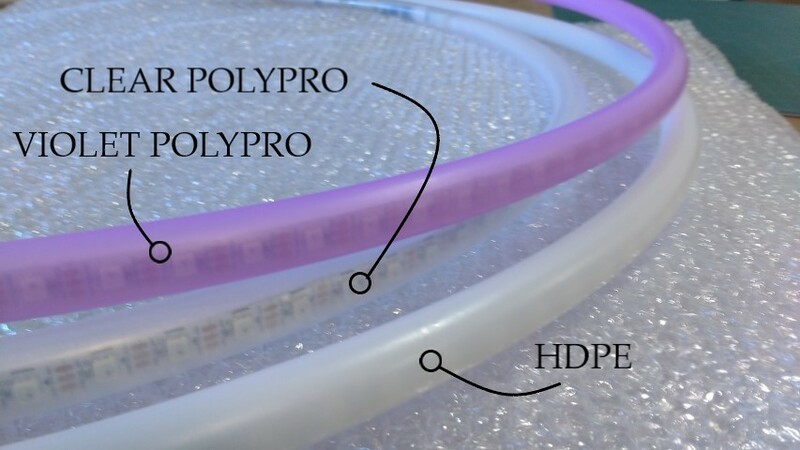 Polypro (polypropylene) tubing is more clear and springier than HDPE. LEDs shine through as brighter, more distinct points of light, with less diffuse glow. Polypro does not tolerate cold as well and can crack when used at low temperatures. It is more prone to cracking and shattering than HDPE at all temperatures, but it is still generally quite tough. It is slightly lighter in weight than HDPE. 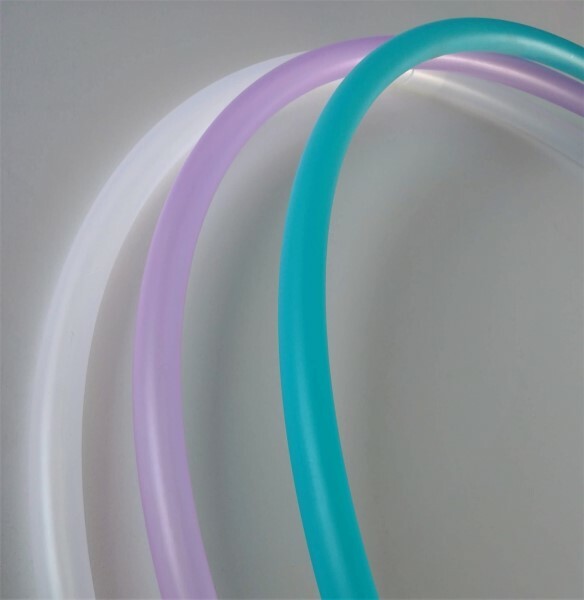 We also offer aquamarine and violet polypro tubing, pictured below. Colored tubing adds a minor tint that may be noticeable on white patterns. In the dark, the effect is fairly minor - all the colors of the LEDs still come through. 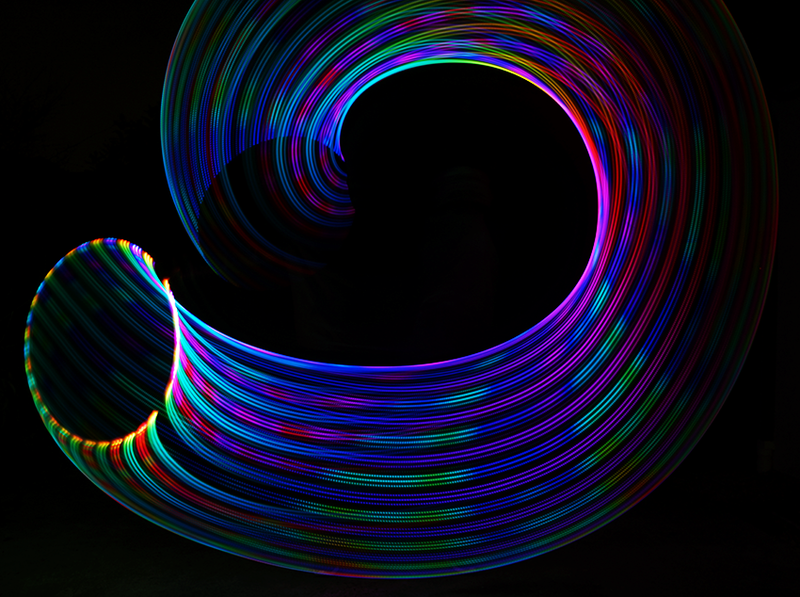 The colored tubing mostly makes the hoop more attractive as a day hoop.